To solve the problem of throwaway RFID CARD, single-use water bottles, founder of Evive Station LLC and WVU graduate Thomas L. Petrini came up with an idea in 2007 — a machine that would clean and fill college students’ water bottles at no cost as it delivered targeted messages on a TV screen. Evive began its test at WVU in April by giving away about 4,000 stainless steel bottles equipped with RFID tags. The test has been a hit at WVU, with an enrollment of almost 30,000. Now the company is going to sell newer-model plastic reusable bottles on Evive’s website from December, priced at $10 for each. Each buyer will fill out a profile with details such as his/her academic major, expected graduation year and interests such as skiing or video games. 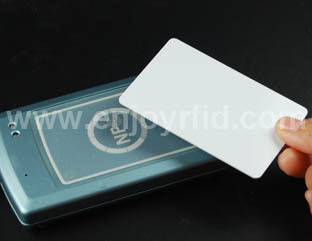 When contactless cards the student stops for a drink, he/she can simply swipe the RFID tag, which is situated at the bottom of the 20-ounce, insulated bottle, on a reader, and a personal identification number is entered and the bottle is cleaned and filled with purified chilled water. The process takes about a minute. In the meantime, ads are shown on a 32-inch screen. These ads are chosen to suit the student, based on his/her profile. Some will be for products or travel, while others might carry messages from employers or the university, targeting finance or nursing majors, for example. Questions don’t go further than what students already might have posted on their Facebook pages, Petrini said, and the PIN protects their profiles from being hacked. “Our only intent is to make the advertising interesting to the user, and relevant to the user,” said Len Kosar, the new CEO of Evive, addressing privacy concerns that some may have over the use of RFID tags. Now Evive rfid inlay is looking beyond college campuses to fitness centers or corporations where its machines could be installed, he said.